The past. Oroku Maji and Masato find the empty box that had contained “The Secret of the Foot”. Masato says that he saw Oroku Saki leaving this morning with the book and provisions. Sullenly, Maji says that he has taken steps to stop Saki from fulfilling the Kitsune witch’s curse. In the mountains, Saki is confronted by his father’s men. The men have been ordered to bring him back alive if possible, but one overzealous Foot Soldier goes for the kill, scarring Saki over his left eye. Enraged at his father’s perceived betrayal, Saki slaughters the assassins. He’s then approached by the Kitsune witch who says that Saki’s father had betrayed them all. The present. The Turtles continue brawling with the Foot at the Clan’s skyscraper HQ while April and Casey navigate their way through the carnage in search of Dr. Miller. They find him, but he’s being guarded by Alopex and a horde of Foot Soldiers. Luckily, Don and Mike get their backs and keep the ninja at bay while April and Casey usher the confused Doctor out of the carnage. Meanwhile, Leo goes toe-to-toe with an unimpressed (and seemingly resentful) Karai while Splinter and the Shredder lock horns once more. The past. 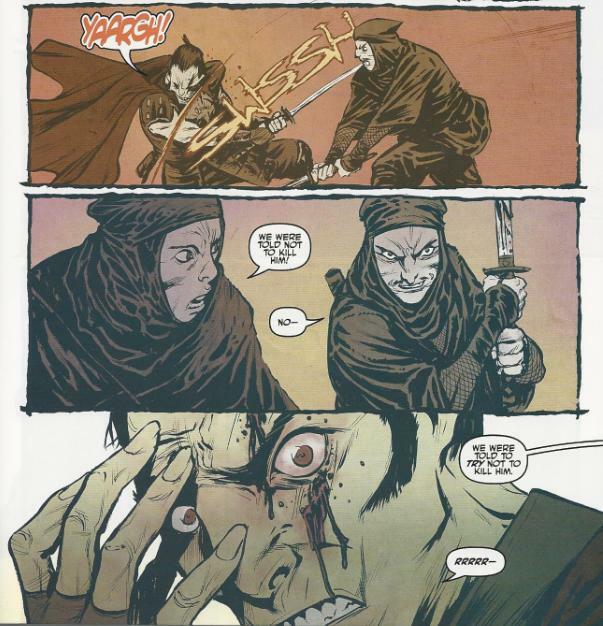 Oroku Saki wakes up in the Kitsune witch’s cottage from a nightmare in which he was killed by his father. The Kitsune says that what he viewed wasn’t a dream, but a past life. She then shows him a vision of how she met a great demon and vowed to do his bidding in exchange for the secret of life itself. She had joined with Tatsuo Takeshi and ruled the Foot Clan in the demon’s service for a century until Saki’s father, Oroku Maji, killed Tatsuo. Tatsuo Takeshi’s spirit, however, was reincarnated in Oroku Saki. The Kitsune witch then asks Saki what price he would pay in exchange for the same immortality he had in his previous life. The present. With Dr. Miller safely removed, the Turtles and Splinter beat a tactical retreat (but not before Leo silences the jealous, prattling Karai with a kick to the face). Everyone loads into April’s van except Raph, who is still busy with Alopex. Raph insists the others leave him behind and that he’ll catch up. They escape in the van while Raph purloins a motorcycle from a frightened motorist. Alopex gives chase on foot, latching onto the van. Raph comes up behind her on the motorcycle and knocks her to the ground. Later, the group relaxes, though they aren’t sure where they can bring Dr. Miller (the lair is out of the question). Dr. Miller is still getting acclimated to the mutant animals, but willingly translates some of Saki’s pages from “The Secret of the Foot”. Mike asks about any resurrected ninja in the book and Miller reads a passage about a “Dragon Warrior” who could not be held by death and was wholly reborn. Leo (nursing a slash to the arm he took from Karai) ponders that if the “Dragon Warrior” is Oroku Saki (and not an overweight panda), then that would mean the Shredder is essentially unkillable. The past. In the dead of night, Oroku Saki pays a visit to his father. He throws the corpse of Masato onto the floor and tells Maji that he not only knows everything about his past life as Tatsuo Takeshi, but has seen a future where he rules all. Maji says that everything he did, he did out of love for his son. Saki renounces his father then dons his gauntlet, intent on killing him. *This story is continued from The Secret History of theFoot Clan #2. 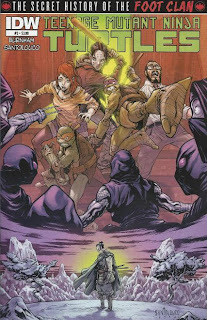 The story continues in The Secret History of the Foot Clan #4. *Karai’s resentment toward Leo stems from TMNT (IDW) #14, where Shredder informed her that he would be replacing her with Leo as his second in command. *This issue was originally published with 3 variant covers: Regular Cover by Santolouco, Cover RI by Ross Campbell, and Cover RE for Jetpack Comics by Kevin Eastman and Ian Herring. God, this needs to be a movie. Preferably without Megan Fox (look at me, I’m being topical!). 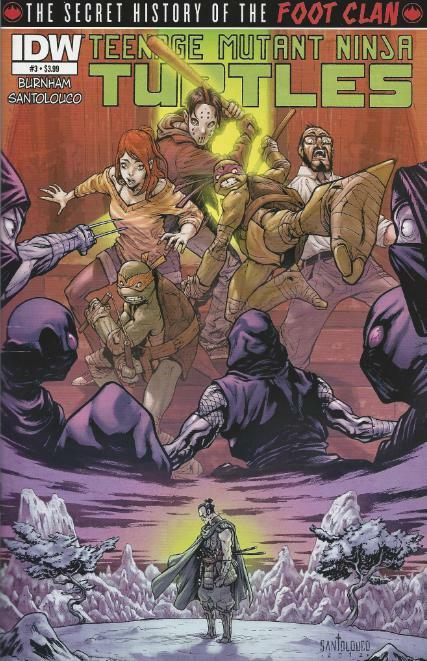 “The Secret History of the Foot Clan” has a cumbersome title and a gloriously cinematic approach to both the storytelling and the art. The back and forth between eras is handled gracefully, with some smooth segues that transition you in and out of each era at a natural, fluid pace that never kills the momentum of the action. The present set narrative and the flashback narrative actively compliment one another, with the contemporary arc revealing tidbits about the past arc and vice versa. It’s a really dynamic script that segments its dueling narratives strategically for the benefit of the overall story flow (and thus the benefit of the reader, too). We finally see Oroku Saki “snap” and make his break into the world of true villainy… and it’s all the fault of one unnamed Foot Soldier that couldn’t follow orders. What a jerk. Saki’s origin in this miniseries has been a tragic one and you feel for his downfall even though you knew the outcome well in advance. I do wonder if his decision to embrace Tatsuo Takeshi’s destiny was a completely conscious choice, or if the Kitsune witch manipulated him further down that path than he otherwise would have gone. True, Saki was distressed at his father’s perceived betrayal, but when the Kitsune unlocked Tatsuo Takeshi’s memories, did the Oroku Saki that Oroku Maji raised cease to exist, replaced by the will of Tatsuo Takeshi? In a strange way, Oroku Saki was never really the “bad guy”, at least in regards to the Shredder’s competing personalities; it was always Tatsuo Takeshi that was the "darkness" while Oroku Saki was the "light". It’s a great play on that squandered element of Mirage’s Shredder origin which described him as a distraught youth, grieving the death of his older brother and manipulated by the Foot into becoming a ruthless killer. The sympathetic angle of Shredder’s past, the idea that he was a pawn being guided by greater forces, is one that has desperately been in need of being expanded upon. It’s great to finally have a Turtle medium willing to delve further into the Shredder’s history and portray him as something deeper than just a generic “evil for evil’s sake” type of villain. Meanwhile, the Turtles take a back seat to the overall story, but the miniseries is called “Secret History of the Foot Clan” so it’s no surprise they’re more secondary players. Never the less, the big brawl at the skyscraper was a furious piece of action rendered by the always impressive Santolouco. I love how catty Karai is in this fight, too; actively criticizing and belittling Leo (for reasons Leo isn’t yet aware of). 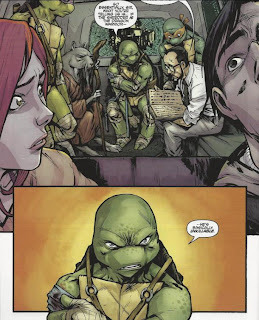 I still find it questionable that the Turtles could be swinging their weapons in a crowded hallway full of ninja and not kill anybody, but IDW's "no kill" policy assures us the Turtles are just "knocking them out". Somehow. I did kind of feel that the main villains, even the Shredder, were somewhat muted in their threat during this fight. Shredder and Splinter’s rematch is reduced to 3 panels, Alopex is still an ineffectual grunt and Karai gets bested by a distracted Leo while trying to give it her all. But again, what saves these moments is Santolouco’s art, which depicts even their failures as epic and exciting. 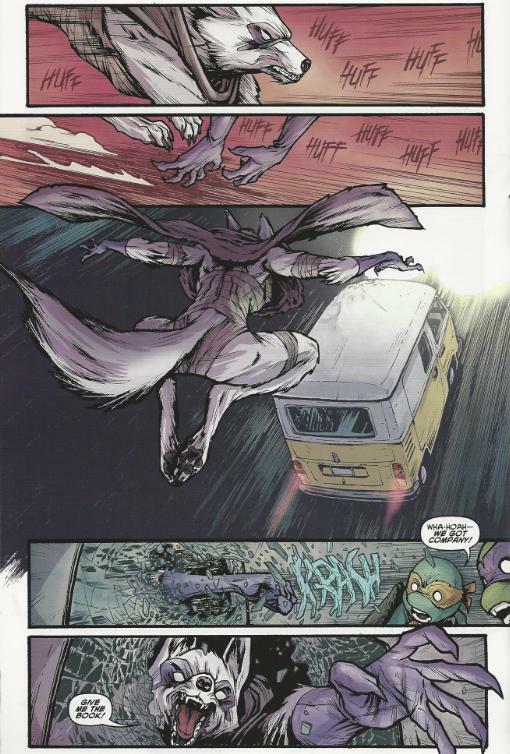 Alopex is as lame a villain as it gets, but the scene where she reveals an heretofore unseen super speed ability and catches up to the van was heart-pumping. She actually stopped being a joke and became a legitimately frightening adversary (before quickly being reduced to a joke again, but still). The entire car chase was rendered masterfully (Santolouco seems to be really good at high speed chases), even if I question whether Raph could throw a helmet faster than his motorcycle was moving and with enough force to knock Alopex off the van. Is that how physics works? If Raph’s moving at (let’s say) 50 miles per hour and he throws his helmet at (let’s say) 40 miles per hour (a slow ball), does that mean it impacted Alopex at 90 miles per hour? But she was attached to the van, so she was also moving at (let’s say) 50 miles per hour, so that means it only hit her at 40 miles per hour, right? The helmet wouldn’t just fly back in Raph’s face as soon as he threw it? My community college degree hard at work, here. 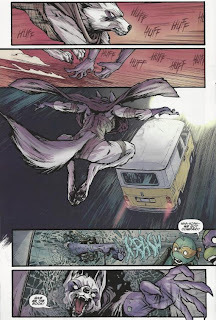 Sometimes, "teh awesome" has to take precedence over the laws of physics in a comic book. And I'm A-OK with that.